I can't cover my thoughts in 140 characters this is too important an issue for sound bites and I can't call in so here are some quick thoughts. Apologies if the thoughts are not very articulate. Please keep in mind, I doubt there is ONE white police officer in the US today who does not know there is a problem with the African American community, likewise a African American person must be living under a rock in the furthest desert to know all is not well. Hence in this situation I am sure both sides were acutely aware of the situation yet both could have done better. "Let me begin by stating how appalled and frustrated we are at this morning's events. .... We are disappointed in the apparent rush to judgment given the fact that the investigation into this matter has not been concluded," said Gene Ryan, president of the police union, at a news conference. "Our officers, like every other American, are entitled to due process." I watched an interview CNN's Chris Como had with the Baltimore Mayor Stephanie Rawlings-Blake, yesterday repeatedly asking her why the officers had not already been arrested. her reply many times, due process must be followed. It appears the Baltimore states attorney has decided due process was in followed. Below is a link to the results of a fun exercise for political junkies like myself. When I came into the Country, I was probably a 50/50 split between Republican and Democrat viewpoints. Then I became more liberal and then I became more conservative! As a friend told me the more money you earn in the US, the conservative you become!? True / False? We all tend to support the "rich" paying higher taxes that is until we break into the bracket right? Don't worry when I get there I shall share if my viewpoints changed or not! Ooops! I missed the last zero... Sorry! So how does a million dollar contract in construction magically become a one hundred thousand dollar contract? Impossible? Nope possible, It does happen you know. Many simple unforgivable, annoying and most importantly COMPLETELY avoidable mistakes I see made by small and large Contractors and Project Managers in the design build industry is one of the major reasons I switched this blog to also cover the design build sector. It seems people out there are making terribly costly mistakes and many times, from a simple failure to follow the rules. Many times, rules that are not complicated at all. Possibly the two most important speeches since 1999. We are waiting and waiting and waiting, the whole country is waiting for Prof Jega to finish using his biro, paper and abacus to collate the final tally for the official announcements. In that time, I have been able to check several news outlets, oh by the way, Many many thanks to Channels TV who is steaming live via Youtube allow those of us in the Diaspora to stay up to date on the election. 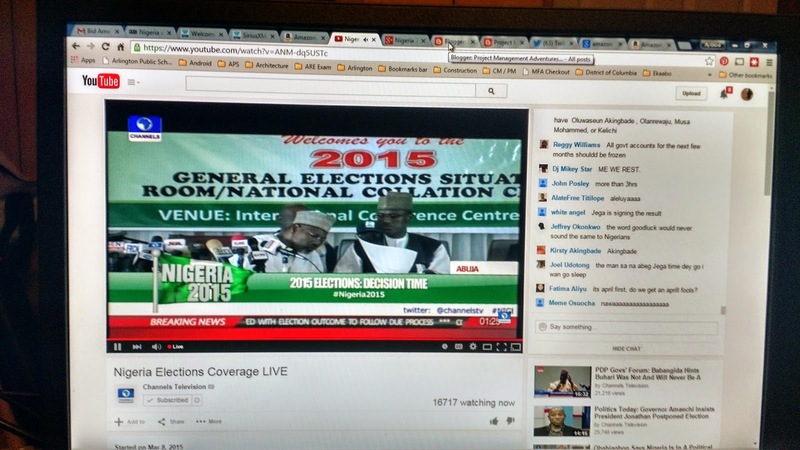 Buhari takes a commanding lead! 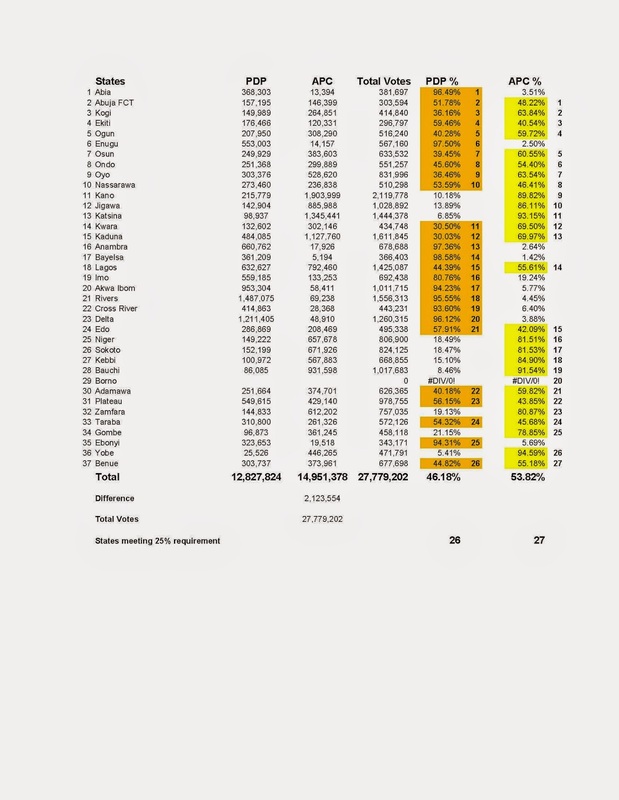 Here is my spreadsheet tallying the votes. Buhari has taken it by over 2 million votes, and Borno will only increase his margin of victory. FACT! 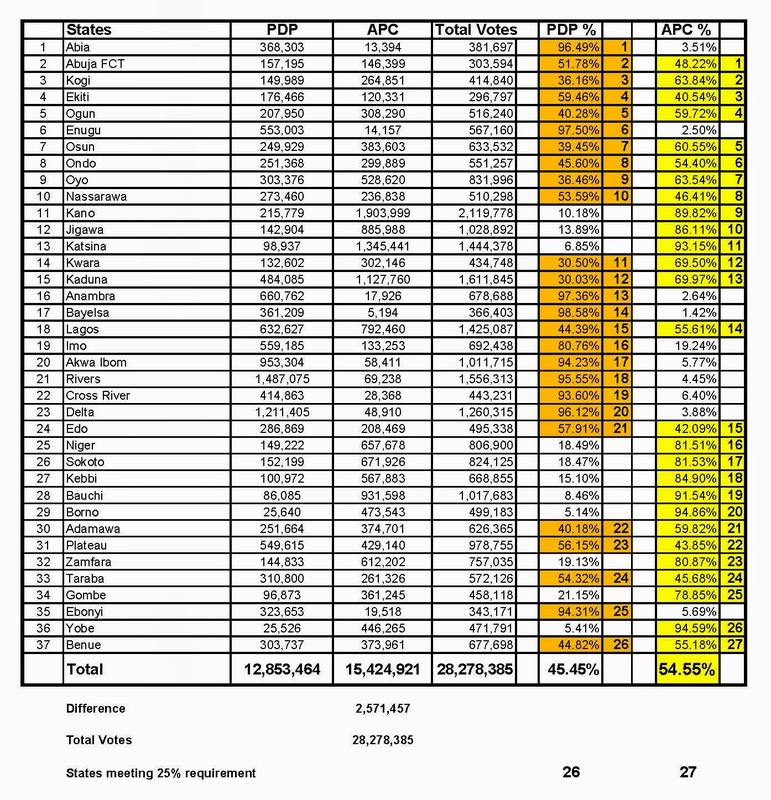 Both have met the 25% requirement in 24 states, APC is winning by over 50% of the vote. Its not too late for Nigerians to yet heed the advise from their brother from another mother from our dear USof A. I know there are those that might take an exception to the quote to keep the country one, but I do believe that country will achieve more by remaining united that becoming divided. Under GEJ is Corruption (egunge) worse or better OR the same...??? So Keren's recent comments and others comments on the increase in corruption under GEJ has promoted me to write this short bog piece. Now folks Please this is by NO MEANS endorsing corruption under GEJ, but rather to ask for us all to check and see if his administration is worse or better than those of the past. So I lived in Ikeja prior to leaving Nigeria. One glorious day as is always in Naija we woke to to news that the Ikeja NITEL exchange had burnt to the ground. Practically the entire Ikeja and Ilupeju areas were now in total phone blackout. As a reminder this was before cell phone era where a common man or woman owed a cell phone, it was at the time still very much a high end luxury item. as some might remember Abacha only gave his Lebanese cronies and best friends licences to operate with MTEL at the time. ...He is not on a construction site or cleaning dishes...??? WTF!!!??? I read with amusement that Sean Penn "spoiled" the moment with his comment above. really? With an obvious question? and from 12 years a slave? And their director Steve McQueen? Or Selma's David Oyelowo (pronounced Oh--yay-law-woa). Goodluck Jonathan: The accidental president who wasted opportunities? So I realize if you read my last blog post you would conclude that I am a Goodluck Ebele Jonathan, (GEJ), "GEJ supporter". I should say, far from it! The fact is, had I been in Nigeria today, (and I still don't understand why we in the diaspora can't vote...) I would probably be tussling with my decision right up to when I have my ballot papers in my hands! So no I am far from sold on the notion that GEJ deserves another 4 years governing Nigeria. Quite frankly I wish there was a third candidate, but no matter how credible that third candidate would be, it is clear that the APC and the PDP are the two political heavyweights in Nigeria today so the president will come from one of those two parties. I have read several articles on why Nigeria needs Buhari and why he will save Nigeria. Sadly, as much as I respect the man and his accomplishments, I have serious doubts on his ability to be a good democratic leader for Nigeria. In a nutshell, his storied history and resume contains NOTHING that points to a man who will accept compromise or reasoned disagreement to his point of view. or who can use persuasive negotiations to being about positive political change. Consider the facts, since the country returned to democracy, Buhari has been unable to stay in a party and accept NOT being the presidential candidate.